I have joined another blogging group! Basically, I am doing this so that some of the blogs I write don’t need much thought. It is because I have been so busy, and because I am so far behind in blogging. The Crazy Cooking Challenge is Tina’s concept. Every blogger who participates is cooking the same dish and posting their recipe at the same time. 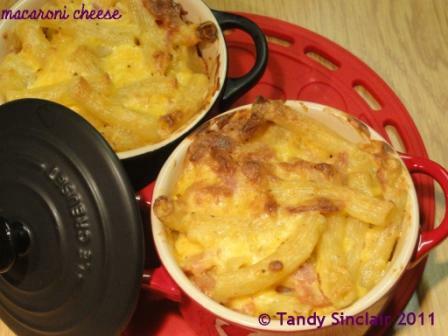 Using google as my search function and choosing pages from South Africa I came across Pessimist Incarnate and used Wayne’s recipe for Macaroni Cheese. Well, let’s put it this way, I used it as inspiration, as I left out one ingredient! Nevertheless, what I did tasted great, and I am sure that is what counts. A gorgeous sounding version of a favorite dish! the perfect comfort food – truffle oil? I know, what was I thinking to have left it off! Glad my blog gave you inspiration! Bacon is a necessity in Mac ‘n Cheese! 😀 Lovely recipe Tandy. This is a great recipe. I love the fact that you don’t have to make a cheese sauce but just mix the creme fraiche with egg and cheese and let the oven do the work for you. Definately a must try. What a great take on my good ‘ole standby! YUM! I love all of the extras you’ve added. This looks amazing! Sounds great – I’ve never had mac & cheese with creme fraiche but you can bet its now on my list of things to make! I’ve also made it with sour cream or buttermilk for that same tang. It’s great!